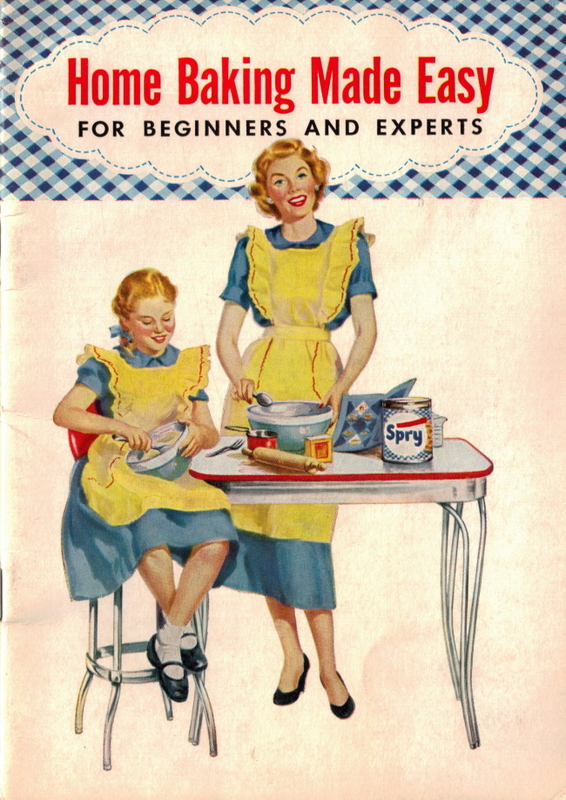 Here is page 8 of the vintage cookbook: Home Baking Made Easy that was published in 1953 by Lever Brothers Company. To review all pages in this booklet, simply visit the Home Baking Made Easy: Spry Category and click on a page title to review that section. There are scans of each of the pages, you can click the full-page pictures to view a larger size. Everybody’s favorite—lightly spiced. 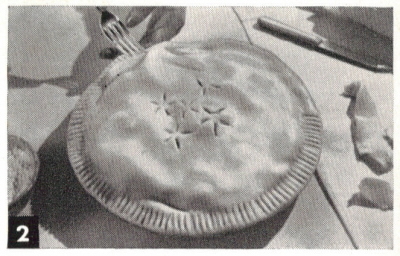 A tart, firm apple that holds its shape in baking is best for pies. Bake in hot oven (425° F.) 45-55 min. Make pastry (pp. 6-7); roll one half about 1/8″ thick and line a 9″ pie pan. Arrange half of sliced apples in pan. Mix sugar, spices, salt and lemon juice and sprinkle half over apples. Arrange remaining apples on top and sprinkle with remaining sugar. Dot with butter. Trim pastry even with pan. Roll remaining dough and lay over apples. Trim pastry 1/2″ beyond pan, fold it under bottom crust, press edges together with fork. Cut slits in top for steam to escape. Brush top with slightly beaten egg white and sprinkle with sugar. Bake as above. *For very juicy apples, add 1 tablespoon CORNSTARCH to sugar mixture; mix well. Juicy-rich, with a pretty “lattice” top! Easy to make with canned peaches. Bake in hot oven (425° F.) 50-60 min. Combine first 8 ingredients. Make pastry (pp. 6-7). Roll one half about 1/8″ thick and line a 9″ pie pan. 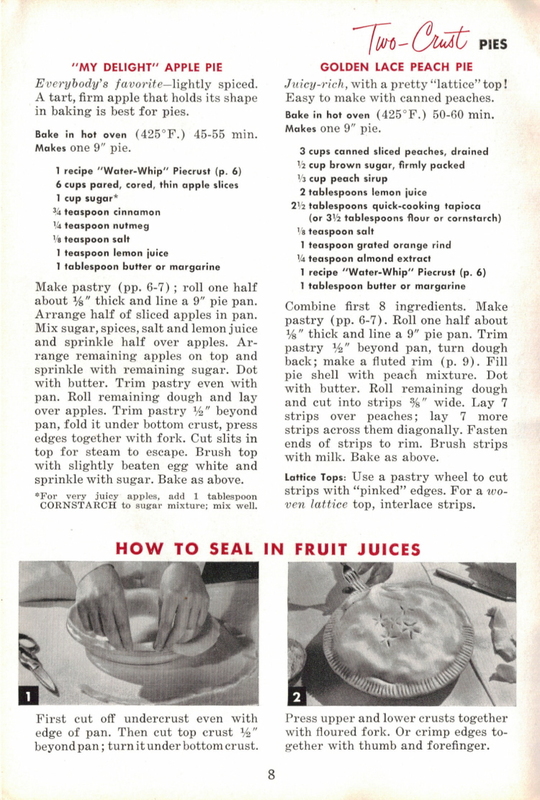 Trim pastry 1/2″ beyond pan, turn dough back; make a fluted rim (p. 9). 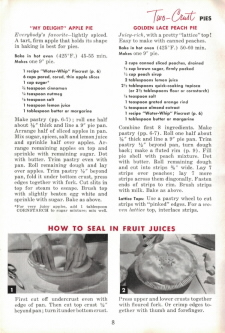 Fill pie shell with peach mixture. Dot with butter. Roll remaining dough and cut into strips 3/8″ wide. Lay 7 strips over peaches; lay 7 more strips across them diagonally. Fasten ends of strips to rim. Brush strips with milk. Bake as above. Lattice Tops: Use a pastry wheel to cut strips with “pinked” edges. For a woven lattice top, interlace strips. First cut off undercrust even with edge of pan. Then cut top crust 1/2″ beyond pan; turn it under bottom crust. 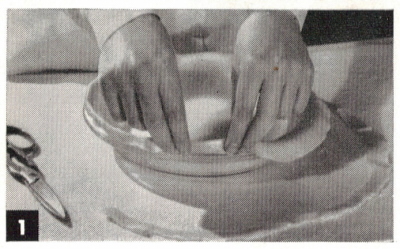 Press upper and lower crusts together with floured fork. Or crimp edges together with thumb and forefinger.